The Australian market ended Friday’s session down 0.3%, to snap a four session winning streak. Over the course of the week the ASX 200 index rallied 3.6%. The Resources sector was the major weight on the market. Energy stocks fell as crude oil prices eased on concerns of slowing demand. Miners also declined with BHP and Rio Tinto down 1.5% and 1.8%, respectively. The Financials sector was mixed with National Australia Bank (NAB) and Westpac lower, while ANZ and Commonwealth Bank improved. NAB shares saw the largest decline, down 0.7%, in response to the news CEO Andrew Thorburn and Chairman Ken Henry would leave the bank in the wake of the Royal Commissions final report. However, the Financials sector was the best performer for the week, jumping over 6%. The Australian futures market points to a 0.07% fall today, being driven by weaker overseas markets. European sharemarkets fell on Friday. The broad based STOXX Europe 600 lost 0.6% and fell 0.4% for the week, the first weekly decline in five weeks. The German DAX fell 1.1%, while the UK FTSE 100 lost 0.3%. US sharemarkets ended mixed on Friday, with Consumer Staples, Utilities and Technology sectors leading gains, while Energy and Financials were the worst performers. Concerns around the US-China trade deal continue to weigh on markets, though reports noted the leaders of both countries are under increasing pressure to strike an agreement. At the close, the Dow Jones was down 0.3%, while the S&P 500 and the NASDAQ both rose 0.1%. Over the course of the week the S&P 500 rose 0.1%, the Dow Jones gained 0.2% and the NASDAQ lifted 0.5%. Notable movers included, Real Estate database company Zillow Group (ZG) rising 3.4%, to close at US$35.25. ZG is set to report this week. Shares in Visa rose 0.2%, Facebook gained 0.6% and MasterCard lifted 1.2%, whilst Alphabet lost 0.3%, Activision lowered 1.3% and Amazon dropped 1.6%. The RBA may have been in denial about the state of the Australian economy for some time, but last week saw two announcements by them that paints a far more downbeat and realistic view. In Friday’s quarterly Statement of Monetary Policy, RBA Governor Lowe gave more detail to the speech he previously delivered on Wednesday. With greater downside risks to the domestic and global economy, the RBA is no longer convinced the next move of the Official Cash Rate will be up. While he is not convinced it will be down either, the shift in bias follows the weak set of GDP numbers in the September quarter, which saw the RBA cut both its GDP growth and inflation forecasts. 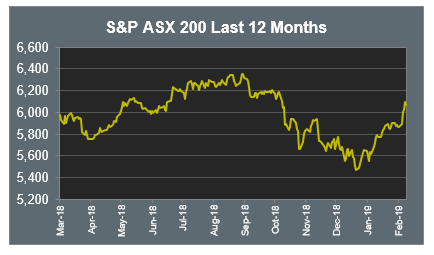 Much will depend on how data evolves over the next few months, with attention being focussed on new data to help determine whether we are in a temporary soft patch, or the start of a longer term trend.